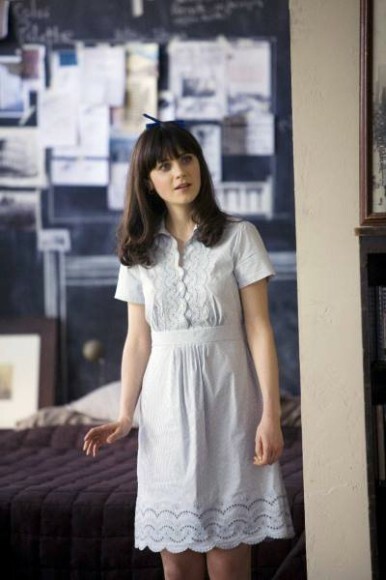 One of my favorite movies of all time is hands down: 500 Days Of Summer. If you haven’t seen it, I strongly recommend it. And if you write it off because you think of it as your typical chick flick, stop right there, because even my boyfriend (who I forced to watch it) liked it! Great acting, humor, amazing soundtrack….there’s literally nothing I hated about it. And if you think it is a love story you are wrong, because as the narrator says in the beginning: this is not a love story. I see I have spiked your interest. Good! I am hoping after you read this post you go out and rent this movie (do people still rent movies?) or download it (more likely)! It’ll make you sad, happy, hopeful and peaceful all at once. You go through a roller coaster of emotions because it is at it’s core, relatable. You feel Tom‘s (played by the adorable Joseph Gordon-Levitt) pain and joy and you get chills from Summer‘s (played by Zooey Deschanel) cold demeanor. Along with the complete adorableness of this movie, Summer’s style is sweet and feminine. A mixture of Mad Men looks and school girl, it may not be for everyone but there are definite tips and styles we can all take from her style and be inspired by. A very common theme in this movie which I am sure you will notice is the color blue. The color scheme in general is muted, even with Tom’s adorable fashion choices, but blue is something we see very often on Summer. It may be due to her big blue eyes, or just because they wanted to keep a similar color pattern throughout the entire movie. Whatever the reason is, it works and I enjoyed every look of this movie! Time to open up Summer’s wardrobe and see what she wore throughout this delightful film. This is a look I am often seen in in the summertime: a flowy skirt (sinched at the waist) and a simple tank top. It’s feminine and most importantly, comfortable. One time while wearing this I added a ribbon in my hair and a short cardigan. It felt like I was straight out of the movie “Grease“. May have been a little overkill. Highwaisted pants have become more and more apparent in today’s fashion and it’s because they can offer a modern spin on an old fashioned style. They ooze sophistication and flatter many different body types. Having gone to a private highschool myself I can relate to this look very well. There are definitely different variations of this look (i.e. promiscuous Britney Spears) but this is a way to pull it off without being inappropriate. All you need is a plain white shirt, with a sweater (sleeves or no sleeves are fine) and a skirt that falls at the knees. A+ for you Summer! Whoever said vests were out of style is wrong, and Summer proves why. A vest can be an unique addition to a look. Without the vest this navy top and grey pants would’ve been a great ensemble, but the vest adds a bit more personality. Another sweet example of a Summer look (and in blue, no surprise there). The detailing of this dress differentiates it from a typical dress, and the navy bow in the hair adds the perfect touch. Navy and green are the color palettes rare couple. They go so well together and yet you rarely see someone pair a nice navy skirt or pants, with a green top. Summer did this perfectly, and added a neutral jacket to the mix to refrain from having an outfit that is too busy. I have said it before that a simple white shirt is a must in every person’s closet, however if you are the type to find this look boring, you can do what Summer did and add a broach or clip, like her Butterfly one! Adds just the right amount of personality to a rather simple outfit (and might I add, the butterfly is blue). Besides who said earrings and necklaces are the only thing you can put on to spruce up your look? Crazy, Stupid, Oh-so-hot, Love. Part 2. A man in a suit (or overall well-dressed) is something I appreciate very much, and I am almost certain I am not the only one. “Crazy, Stupid, Love” is one of those movies that captures everything : love, laughter, sadness and surprise. On top of all this, the women and men had a great sense of style that just made the entire movie all the more pleasant for the eyes. Jacob Palmer (played by Ryan Gosling) and Cal Weaver (played by Steve Carell) show us exactly why a man should hold in high regards the way he dresses himself. The same rules for suits apply also tothe casual look: simple is better. A simple grey shirt does the job on looking comfy and laid back. This is probably my favorite Jacob look of the movie. I’m a huge fan of navy, and an even bigger fan when it is combined with brown or beige. This tan / navy color combination catches the eye and makes a statement. Have you ever seen anyone look as good eating a pizza than him? End of school year means one thing: summer is on it’s way. And Cal welcomes summer with open arms in this light grey suit with a white blouse. Clean, crisp, and ideal color combination for the warmer days. It was time for Jacob to go a tad out of the box and opted for a rich brown / burgundy suit. His shirt is simple which gives room for the suit to be the main component. Still remaining in the neutral tones, this is a suit color you rarely see, but definitely works! In this scene Cal followed in Jacob’s mighty fine foot steps and sported a navy suit. This type of navy is a bit brighter but balances out great with the black shirt. Such a great look especially for dark-haired men. Jacob goes for the more casual approach and opts for a simple black v-neck sweater which works just as well as one of his suits. These men are clearly ready for a night out! Love is a many splendid thing, as they say, that can change your life from one moment to the next. “Crazy, Stupid, Love” shows different aspects of love in a most entertaining way and I thoroughly enjoyed it. A big reason why I enjoyed it as much as I did probably has something to do with the ever-so-charming Ryan Gosling who plays Jacob Palmer, the wealthy womanizer who takes Cal Weaver (played by Steve Carell) under his wing and teaches him how to act and dress like a man. In today’s society, men often think they need to spruce up their look by adding some funky colors to their outfits and suits. I, on the other hand believe that by staying in overall neutral tones is the best way to go in order to stay sophisticated, classy and irresistible. That’s exactly what Jacob Palmer does in this movie. He made most of us women (and some men no doubt) stare in awe at his flawless sense of style and drool just a little bit (or was that just me?). Jacob was the ultimate mentor and therefore Cal deserves some limelight as well because his style goes from drab to fab in no time thanks to Jacob! Even though the women of this movie also had a great wardrobe, it’s time to take a close look to the men who lit up the big screen and our hearts. He….He….Um…Ok Sorry, got distracted for a moment just mindlessly staring at this work of art. Shy but confident smile, styled hair and a great suit, who can resist this?! Sometimes keeping it sleek and simple is key to a great look. Black with pin stripes and a white shirt is all Jacob needed to get a lucky lady’s attention that night. Dark tones is the way to go to give off that mysterious look. A dark grey suit and black blouse gives off the laid back and ready to mingle approach which is great for a night out on the town. This was Cal’s first day as a new well-dressed man. This is a great way to still dress up, but without actually wearing your stereoptypical suit. A suede blazer is a key item to invest in for Fall and Winter. Another prime example of Jacob using nothing but neutral tones to end up with a breathtaking look. This is actually one of my favorite color combinations for a suit: a medium toned grey suit with a black blouse. To make this outfit even better, it’s a 3-piece suit which as men get older, this should be a staple in their closet. At parent-teacher night obviously Cal won’t wear a suit, but he still dressed to impress for the occasion. A semi-casual look consisting of a blouse under a dark v-neck sweater and a great looking jacket of the same tone made his wife question why she left him in the first place. This perfectly fitted (not too tight, not too loose) thin polo is a great combination of casual and dressed up. Without wearing the suit, he still looks put together. Furthermore, that light brown leather watch is the ideal timeless piece. Stay tuned for Wednesday’s post on the review of the handsome men of “Crazy, Stupid, Love”. Do you love a man in a suit as much as I do? Pretty Woman, walking down the street. If Roy Orbison’s song popped in your head, then you are ready for this post. It’s time for Pretty Woman. It is one of my favorite movies because this 1990’s Cinderella tale had it all: humour, love and most importantly, fashion. When someone thinks of this movie, this is the outfit that pops to mind first. There are definitely aspects of the look that can be worn today (in a non-prostitute kind of way). The black over the knee boots and the men’s cut blazer are exceptionally popular and look like they will be considered staples in our society for women. The main attraction: The blazer may be a few sizes too big, even for a man, but the cut and color palette is something I would choose. Not to mention, the fact that the lapels are black reinforce its classic look (a white blazer with black lapels is also a very sought out item of today). A memorable scene of the movie is when we get a first glimpse of Viviane in a beautiful short black lace dress while she was waiting for Edward in the bar lobby. A little black dress is a necessity in every girl’s closet. There are so many different variations of it which makes it all the more fun to shop for. Lace dresses are found in every store today and have taken the LBD to the next level. The main attraction: I love the detailed neckline of this dress. Looks like a necklace when in fact it is attached to the dress itself. It adds an accessory without going over the top. With a neckline like this it is easy to keep hair up, as well as down, but it’s important to follow in Viviane’s footsteps and keep earrings relatively simple and small. So many outfits she is trying on are noteworthy but it’s what she starts off in what catches my eye. The androgynous look is again present in this outfit when wearing Edwards top (lucky her) as a tie front and sporting her modern stud bracelets. The main attraction: There is almost nothing I value more than a white shirt. I love that a crisp white shirt (especially a men’s cut) can look so good on a woman. Something as professional as this can also be dressed down and will be just as timeless in another 20 years from now. Stay tuned on Wednesday for the rest of Pretty Woman’s looks review and admiration!